Michigan's Jackson Citizens Patriot reports that at the Girl Scouts Heart of Michigan’s “Honoring Our Sisters” Native American pow wow, girls learned an inter-tribal dance. 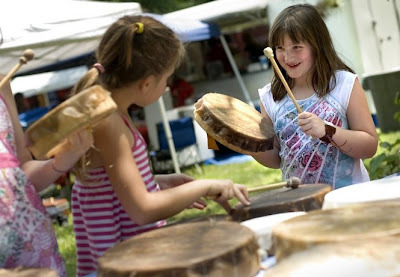 A drum circle, dancers and speakers were all on hand to teach scouts and other visitors about American Indian culture. Another highlight of the annual pow wow was a traditional tipi, built by drum maker and self-proclaimed “Tipi Man” Andy Baxter. The Cleveland resident lives in the tipi during pow wows.